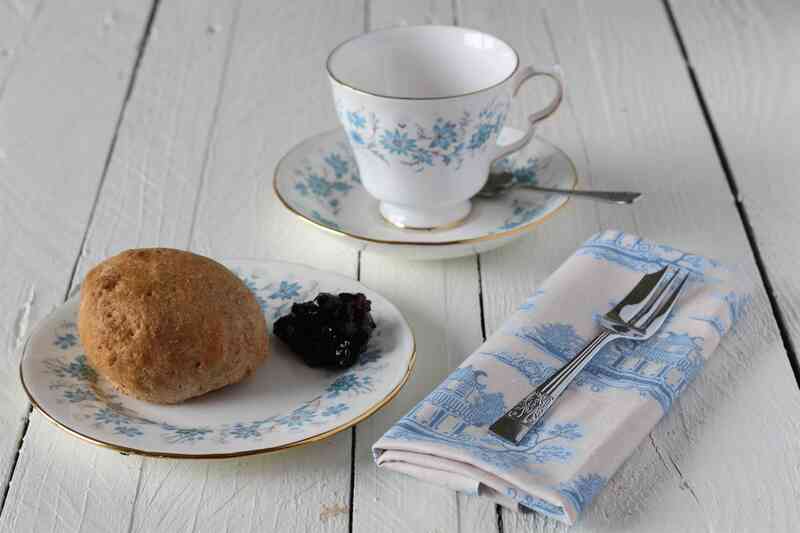 I was asked recently by the charity Tuberous Sclerosis if I would write a blog post to promote their Tea and Scones week which runs from 12th to 18th May. The charity raises funds and awareness into this rare genetic condition which can cause epilepsy, learning disabilities, autism and renal problems. There is currently no cure for the condition and so they hope to raise money for medical research by encouraging people to indulge in a spot of baking. It was only when I came to sit down and write the post that I started to wonder how I could relate scones to gardening. Then I thought about all the gardens I have visited over the years and some of those which stick in the head most are often those where I can remember whether their baking was up to scratch too. I don’t know what that says about me, that I’m a little obsessed by food perhaps, or that I’ll forgive any gardening fashion faux pas if you’ve sated my appetite with something sweet. Whether it’s a National Trust garden, a lavishly designed private space or somewhere on a more modest scale the gardening year wouldn’t be quite the same without a visit to one or more of these for inspiration. A sunny afternoon spent noseying around someone else’s garden revelling in their peonies or questioning their taste in garden ornaments is as quintessentially British as it gets. But the day isn’t truly complete unless there’s the opportunity at some point for tea and cake. For any garden which opens to the public the refreshments on offer are a vital source of extra income whether it’s to raise revenue to maintain the garden or in the case of the NGS to make more money for charity. 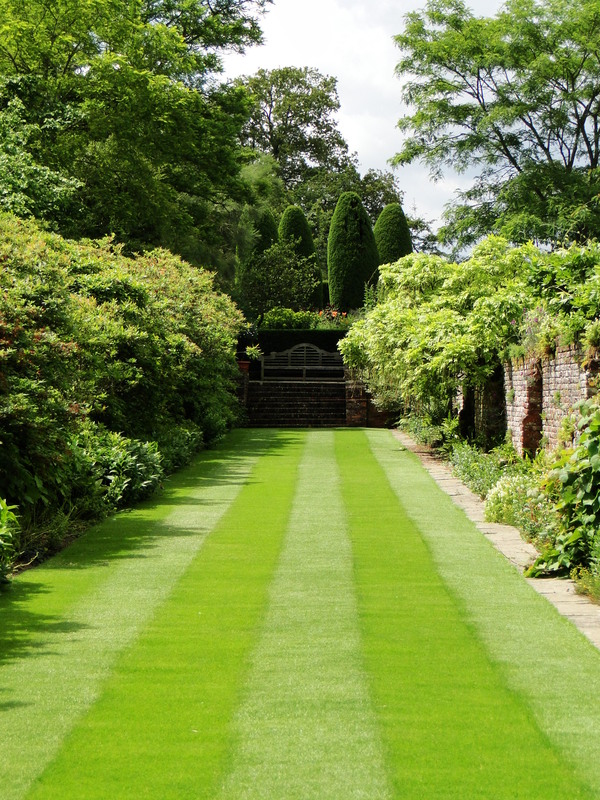 The National Gardens Scheme have facilitated the public access to thousands of gardens across Britain since it started in 1927. Not only does it give gardeners the opportunity to show off their creations it’s also the chance to taste some pretty impressive baking. This is not the time to turn up with some shop bought Mr Kipling’s. I am partial to a slice of traditional Victoria sponge or the zesty hit of a lemon drizzle but I’m not sure you can beat the classic cream tea. A scone, some jam and a dollop of clotted cream is a simple but winning combination. Yet this simplicity belies the controversy which surrounds the humble scone. How you pronounce ‘scone’ for a start will reveal where you grew up. Say ‘scone’ so it rhymes with ‘gone’ and you’re most likely a northerner; pronounce it so it rhymes with ‘cone’ and you’re from the south. Where the demarcation line between the two is I don’t know; it would be interesting to find out though. Is there a town somewhere in Nottinghamshire or Bedfordshire where north becomes south? So often in Britain the simple pronunciation of a word can mark you out immediately as an outsider. We once lived in a suburb of Guildford called Burpham. To us, until we had been shown the error of our ways by the estate agent, it was ‘Burp – ham’, turns out the locals referred to it as ‘Burfam’. Now I live in Wales and there’s a long list of places I wouldn’t even know where to start when it comes to pronunciation. I wonder if other languages have this too? Getting back to the scones, there is also the whole ‘which goes on first’ debate as to whether you smear your scone with jam first or the cream. For something that only consists of three ingredients it’s remarkable and some might say very British that it can stir up such a fuss. Much of this is due to the rivalry between Britain’s most south-westerly counties – Cornwall and Devon. A Cornish cream tea places the jam on first and a Devon cream tea is vice versa. I’m sure my late Cornish grandmother would be pleased to know I’m a jam first girl. It’s easy to think that something like this was dreamt up by some PR person for the tourist board but I know something of the fiercely protected regional differences of the south-west. When members of my family moved, the not particularly great distance of 26 miles, from a small fishing village in Cornwall to the city of Plymouth at the start of the 20th century it was considered a move to a ‘foreign’ country as they had crossed the River Tamar into neighbouring Devon. Scones are so simple to make, in fact they were the first recipe I was taught in home economics. A bit of self-raising flour, milk, sugar and butter. I prefer a plain scone and I always reduce the amount of sugar suggested in the recipe. In my opinion, the sweetness should come from the jam. I’m happy enough with the addition of a few sultanas but the pleasure of a scone is it’s simplicity. As for recipes, there are plenty to choose from. I tend to use a Mary Berry one but have used Delia and Hugh Fearnley-Whittingstall too. I’d draw the line at the blueberry, coconut and lime scones I came across the other day. Several steps too far, I think. Then we come to the jam. A cream tea generally comes with strawberry or raspberry both of which I love, but if I had the choice it would be blackcurrant every time. If you fancy something seasonal to try at your Tea and Scone event next week try this rhubarb and vanilla jam. I tasted it at Lia and Juliet’s Supper Club last year in the middle of some homemade jammy dodgers and it was delicious. So why not get together with some friends to scoff some scones, chat about plants and raise a bit of money for charity. For more details about Tea and Scone Week visit tuberous-sclerosis.org.uk and if you’d like to share recipes and photos tweet @UKTSA and use #TeaandSCones. Oh! And I’d love to hear your garden and cake stories. The best and the worst and the sweet treat you can’t resist. You might have gathered by now I’m passionate about flowers and particularly British grown cut flowers. 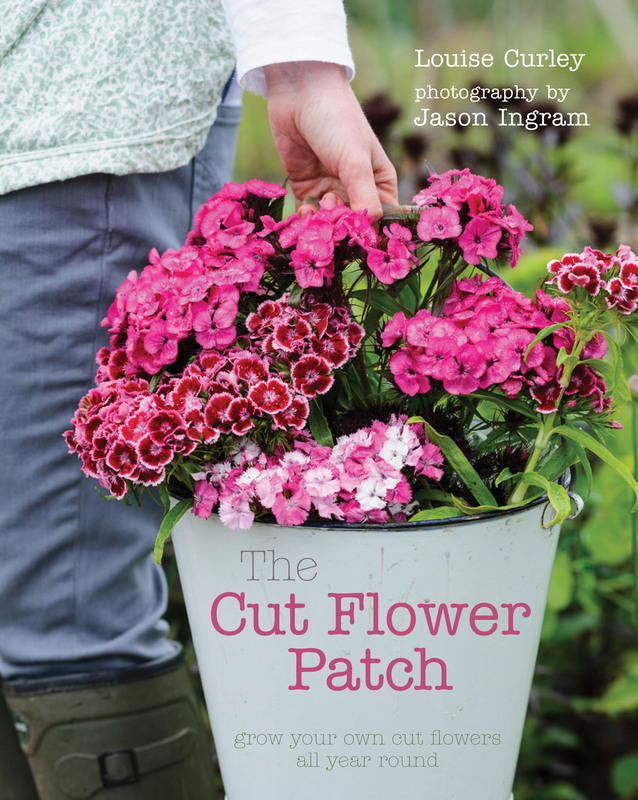 The overwhelming majority of cut flowers available in the UK are imported. It’s a little odd then to think that we used to supply all of our cut flower needs up until the mid-twentieth century. The advent of motorways and air travel brought the flower industry in Britain almost to its knees. But, over the last few years, I have discovered that there is an inspiring group of small scale flower farmers out there who are trying and succeeding in turning the tide away from imported blooms. They are embracing social media to get the message across that British flowers are the best, whether it’s via forums, Facebook, Instagram or the hugely popular hour-long Twitter chat on Monday evenings from 8-9pm with the #Britishflowers. They are a delightful group eager to share and help and it’s how I came to meet Sara. She came to my rescue last spring when I put out a request on Twitter for some seedlings. We ended up meeting in the car park of a hotel and swapping plants from the boots of our cars and a friendship was forged. Sara is addicted to flowers and her enthusiasm is contagious. So it was no surprise when I heard that she wanted to use her love of all things flowery to inspire a new generation of gardeners. 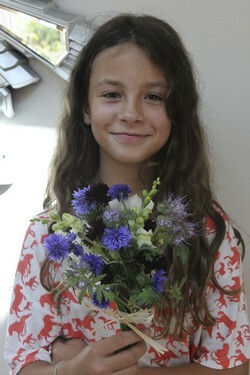 With her friend, Cally (you might know Cally from her blog Countrygate) they have devised Our Flower Patch. Both Cally and Sara were teachers before life took them in different directions. 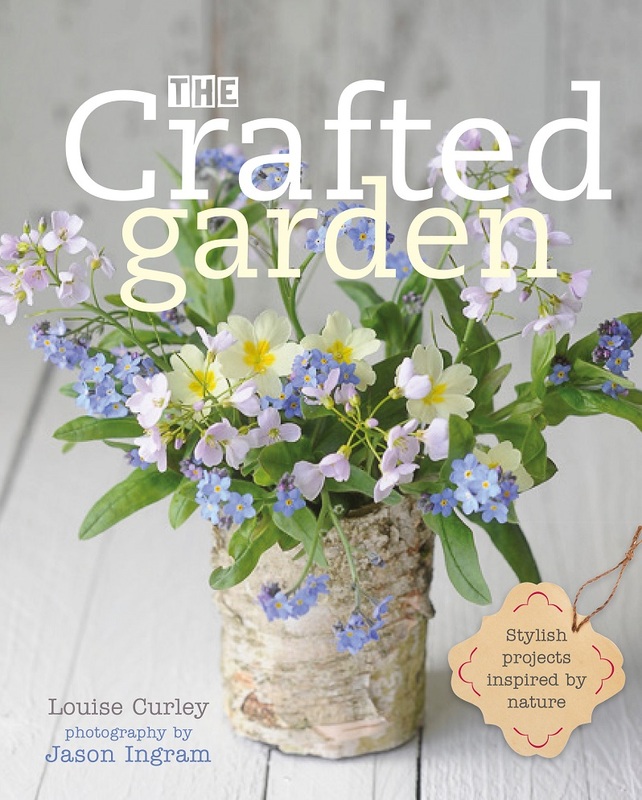 Cally now designs and delivers outdoor education projects for bodies such as the National Trust and Sara grows and sells cut flowers from her field on the edge of Salisbury Plain. 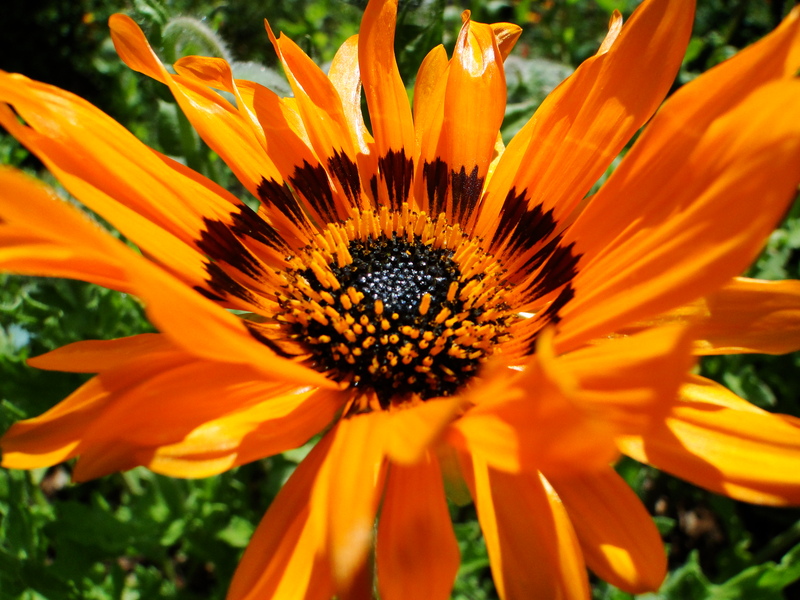 The idea behind Our Flower Patch is to combine their knowledge of education and their passion for flowers. When you think about it, growing plants is a perfect way to teach children so many different skills, whether it’s using maths to measure out flower beds, using science to understand what a plant needs to grow, improving communication and team working skills as they garden together or learning about geography by finding out where plants originated. So Sara and Cally have put together an online resource for schools, community gardens or youth groups such as the Scouts. 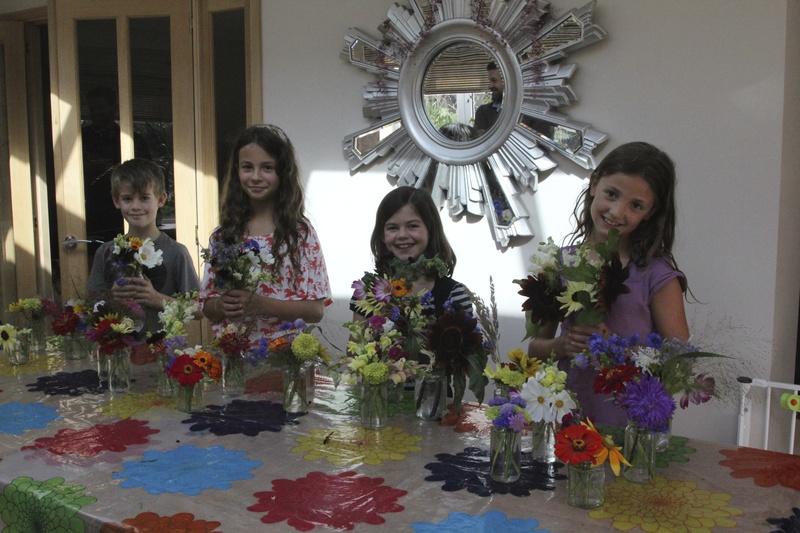 The hope is that they will develop their own cut flower patches using this as an opportunity to teach aspects of the National Curriculum and, at the same time, it will offer those who take part the chance to make some money by selling the cut flowers they produce. For Our Flower Patch, Sara and Cally have joined forces with Higgledy Garden and specially selected a collection of flowers which will appeal to children and suit the needs of a school cut flower patch. For Sara, her must-have flower is Nigella ‘Persian Jewels’ for its excellent mix of colours and its fantastic seed pods. 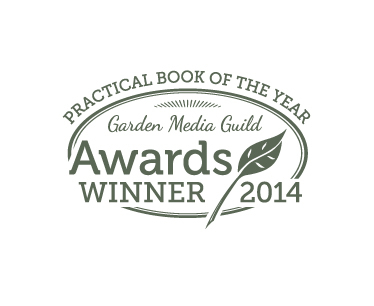 Calendula is Cally’s favourite. As she says, ‘It’s easy to grow, self seeds enthusiastically and is the perfect plant to get children to understand about collecting seed’. 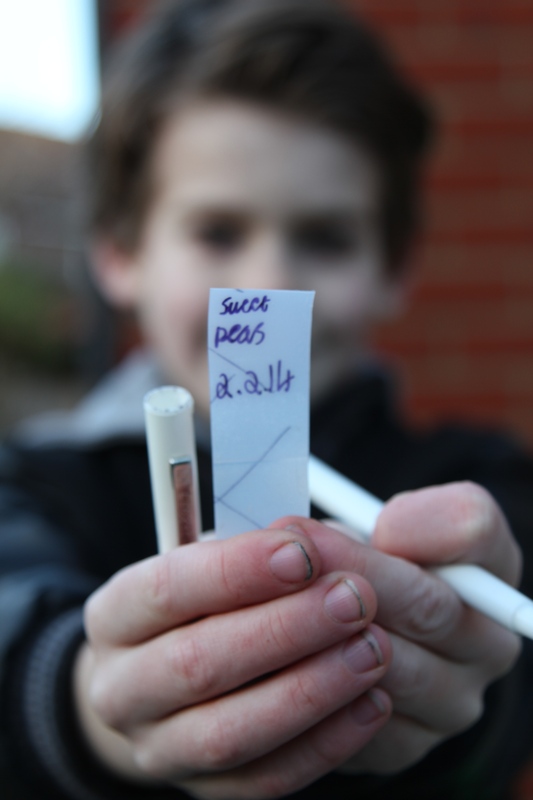 They have also devised a series of projects from learning about compost and the water cycle to creating art using nature and the importance of providing food for pollinating insects. Cally and Sara will provide members with regular blog updates, activities and advice. The site will also encourage adults and children alike to share their experiences with the hope that an online community of flower growers will blossom. I know how passionate both Sara and Cally are, so I’m sure Our Flower Patch will be a huge success. If you are involved in education or youth work, are a parent or you know someone who might be interested in setting up a school flower patch then you can find more information about how to subscribe at http://www.ourflowerpatch.co.uk, Facebook Our Flower Patch and Twitter @ourflowerpatch. You can also contact Sara and Cally direct. Seeing the garden outside descend into its winter slumber with soggy, decaying foliage and bare earth appearing as plants die back can make me feel a bit glum but I know I appreciate spring all the more for its vibrancy and zingyness because I’ve gone through the grey and damp of winter. It’s hard though, when I’m working on something that needs me to write about summer and the abundance on my plot, to feel the inspiration when I’m typing wearing fingerless mittens, a massive cardigan and slipper boots whilst sat in front of my SAD lamp. That’s when I turn to my store of photos for inspiration. They’re a reminder that winter will pass even if it doesn’t feel like it at the moment. The other day I came across some photos of a visit we made to Powis Castle in mid-Wales a couple of years ago. It was somewhere we had wanted to visit for a while and seeing as it was Wellyman’s birthday we thought we’d make the journey. Now managed by the National Trust, the castle and its gardens are set in a stunning location, The medieval castle, distinctively built from red stone, is perched high on the edge of a ridge and to one side gardens tumble down in a series of terraces. The gardens have a strong influence of Italianate and French design and certainly on a warm sunny day in June it was easy to think we were somewhere in Europe rather than the Welsh borders. Enormous dark green clipped yews cascaded over the terraced gardens. The scale of everything was really quite something. The castle with its position on the edge of the cliff looms over the garden. When the gardens were designed in the 1680s by William Winde, who had also created Cliveden in Buckinghamshire, he built terraces and herbaceous borders on a scale that matched the grandeur of the castle. The top terrace has deep borders either side of a path with impressive planting and this is replicated on the terrace below. Statues and enormous pots compliment the planting, again giving the place a continental air. The terraces led down to an orangery packed full of Clivias or Kaffir Lilies. These tender plants from South Africa were named after Lady Charlotte Florentina Clive, the granddaughter of Robert Clive, otherwise known as Clive of India. Unfortunately not in flower for our visit it must like a spectacular sight when they are in bloom. The shelter from the castle and the terracing has created a micro climate which allows an impressive array of plants to be grown. They have a good selection of Abutilons, an exotic plant, which takes you by surprise when you see it thriving here in mid Wales. There are some beautiful Salvias, Ceanothus and a good selection of Roses. This probably isn’t the best garden to visit if you have mobility problems as there are plenty of steps which are quite steep in places. The lower garden was originally a kitchen garden but became a more informal flower garden at the beginning of the 20th century. Packed with Peonies and Alliums when we visited, you also get some stunning views back towards the castle. From this lower garden it’s possible to walk through a woodland area created in the 19th century and planted with rhododendrons back towards the castle where there is the opportunity to purchase a plant or two from the small plant nursery. Generally, I’m disappointed with the selection of plants on offer at these places. So often the plants for sale are those ubiquitous varieties you can find anywhere not the unusual plants you’ve spent the day admiring but here at Powis Castle there was an excellent choice and the blackcurrant Salvia particularly attracted my attention. Although with nowhere to overwinter it I resisted the temptation. Powis Castle is admittedly a little off the beaten track, although this has its advantages as there were no Sissinghurst style hoards to contend with, but it is definitely worth a visit with its stunning setting, gorgeous plants and a style of garden design not often seen in the UK. For more information about Powis Castle take a look at the National Trust’s website. If you want to see what I get up during winter take a look at my blog post over at Sarah Raven’s blog Garlic and Sapphire. Cotehele has been on my must visit list for some time now. A Tudor manor house with 19 acres of gardens and woodland perched above the River Tamar in Cornwall it was once owned by the wealthy Edgecumbe family but is now managed by the National Trust. The gardens were fading into autumn and, as with most Cornish gardens, are probably at their best in spring and early summer when the azaleas and rhododendrons are in full flourish. But it was not so much the gardens that I had come to visit, strange as it may sound because this was more about a bit of fruity pilgrimage. The River Tamar forms the boundary between the counties of Devon and Cornwall and, once, used to be a hub of food and flower production. The slopes of the valleys down to the river used to be the site of many market gardens and away from the Tamar orchards covered the land. The area benefited from good rainfall, shelter and ground that warmed up quickly in spring and was particularly famous for its fruit with the first strawberries and cherries being especially prized in London. As far back as 1796 Bere Ferrers was known for its pears, cherries and walnuts but it was really the Victorian period up until the 1940s that saw the peak of production. Much of the produce was taken down stream by steam boats to Plymouth and Devonport but once the railways came to the area the fruit, vegetables and flowers would leave from stations such as Calstock destined for the markets of Borough, Spitalfields and Covent Garden in London. Once tourists used to travel upstream on boats to gaze at the blossom that clothed the valleys and the daffodils grown for picking for florists in London. Now the valley is no longer so productive. It’s still possible in places to see where the market gardens once were but the land has mainly become overgrown. At Cotehele, however, they are still trying to preserve the heritage of the area. They have some 13 acres of old orchards and in 2007/08 they established the ‘Mother Orchard’, 8 acres of mainly Cornish and Devon varieties of apples, pears and cherries that have become under threat with the grubbing up of orchards. These trees will act as a gene pool, allowing the National Trust to propagate more trees, for sale and planting at other properties. 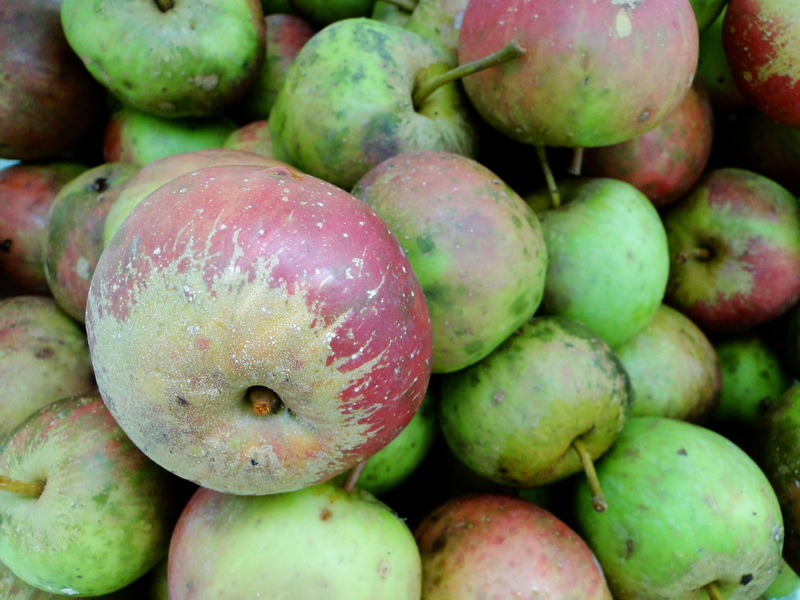 I’m always astounded by the incredible number of apple varieties we used to have that have fallen foul of modern agriculture, supermarket supply chains and us, the buyers, seemingly happy to buy bland but shiny, uniform and blemish-free fruit. Cornish Gillyflower, Colloggett Pippin and Manaccan Primrose. The names of these forgotten varieties alone make them worth buying. 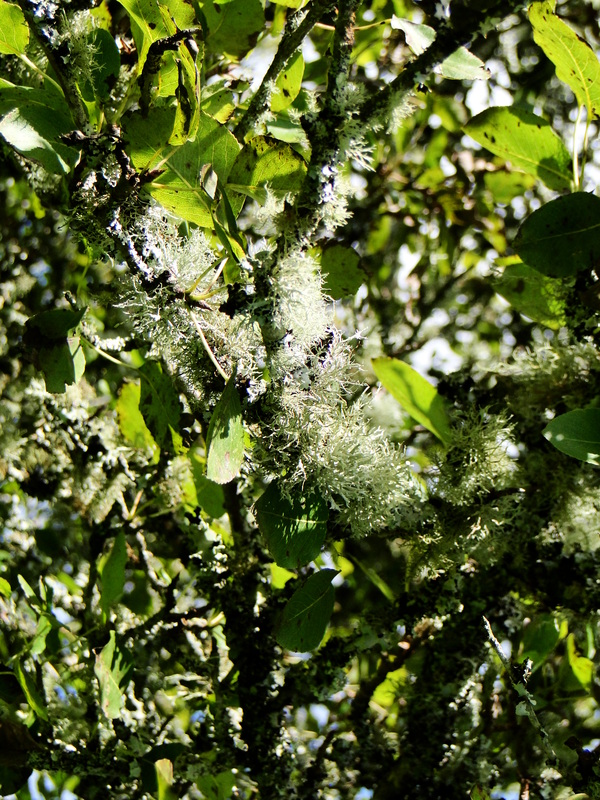 The old orchards with their sprawling, lichen covered branches were beautiful and must be an incredible haven for hundreds of species of insects. The trees looked like they had had a hard time, just as many fruit trees do after this year’s appalling weather. 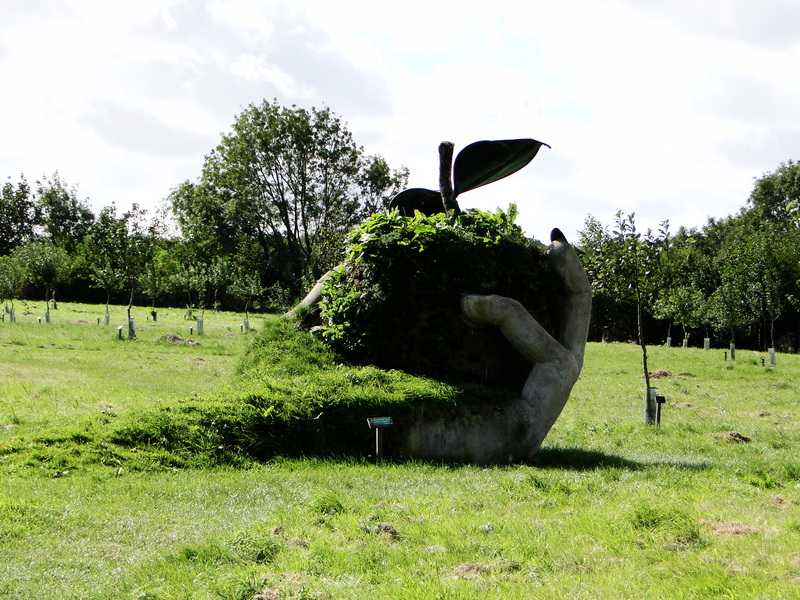 The ‘Mother Orchard’ is in its infancy still but it was such an inspiring place and I loved the apple sculpture giving a modern touch. Wellyman was rather more taken by the solar powered mower that was pootling about keeping the paths trimmed. A clever little creation that knew when its battery was running low and would take itself off to its little ‘kennel’ to get a recharge. 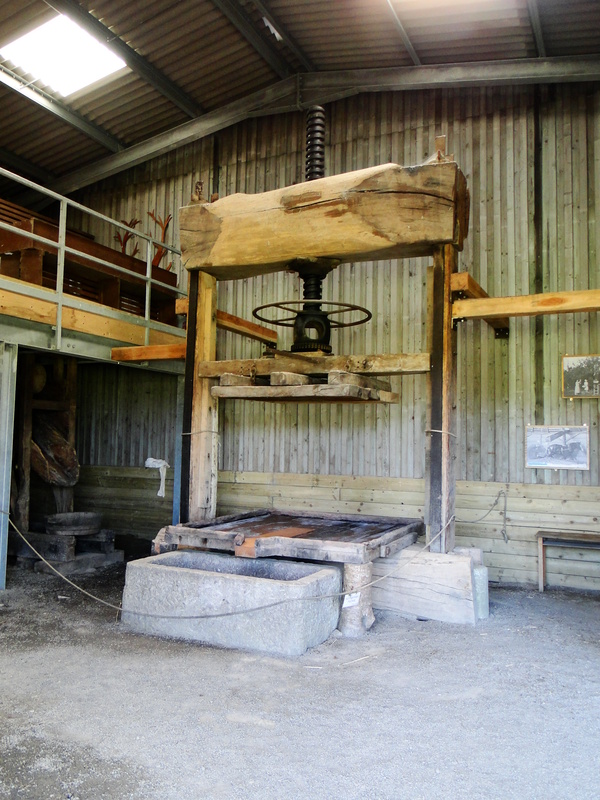 At the top of the orchard was a large barn that housed a cider press from the 19th century that had been relocated from Bovey Tracey in Devon, restored and ‘pressed’ into action. It can squeeze 1.5 tonnes of apple pulp in one go making 900 litres of apple juice. There were a few barrels dotted about and Wellyman spotted one that looked like it was in use. Easing the plug out of the barrel we had a sniff and I was nearly floored by the potency of the liquor inside. Wellyman, on the other hand, is made of sterner stuff. The visit was special for another reason. Some of my family, long before I was born used to live in a small Cornish fishing village not far away. When the fishing industry went into decline at the end of the 19th century and work was hard to find many moved to Plymouth to work in the large naval dockyard and that is what my ancestors did. This is an area they would have known well which added another element, knowing that they would have seen this area in its heyday. Cotehele has another claim to fame and that is the everlasting garland that is created from over 30,000 flowers grown on the estate which is then hung in the hall. Visitors from November can see the garland being constructed by National trust staff and then see it hanging in place from December. I have yet to see this spectacular but hopefully I’ll time my next visit for winter. For more information on Cotehele (pronounced Coatheel, by the way) take a look at the National Trust’s website. 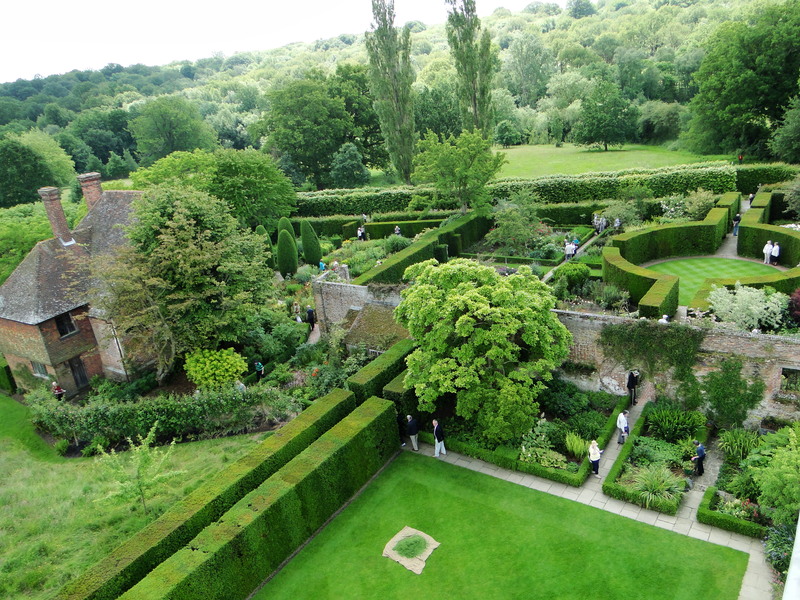 The buildings and ruins of Sissinghurst Castle maybe noteworthy attractions themselves, reminders of Elizabethan Britain but it is the gardens, created in the 1930s by the author, Vita Sackville-West, that people flock to see. Described in my Good Gardens Guide as, ‘one of the outstanding gardens of the world’, we hadn’t initially planned to visit but it seemed to crazy to be so close and not see such a prestigious garden. Now under the care of the National Trust the 9 acre garden and surrounds are undeniably beautiful, a true evocation of an English garden. Inspired by the gardeners of the day; Edwin Lutyens, Gertrude Jekyll and Lawrence Johnston, Vita and her husband Harold Nicolson set about creating a garden that was, as Vita described, ‘Profusion, even extravagance and exuberance within the confines of the utmost linear severity’. Vita was self-taught but word of her accomplishments spread and, although known as a poet and novelist, she went on to write a gardening column for a national newspaper and produced a series of popular gardening books. 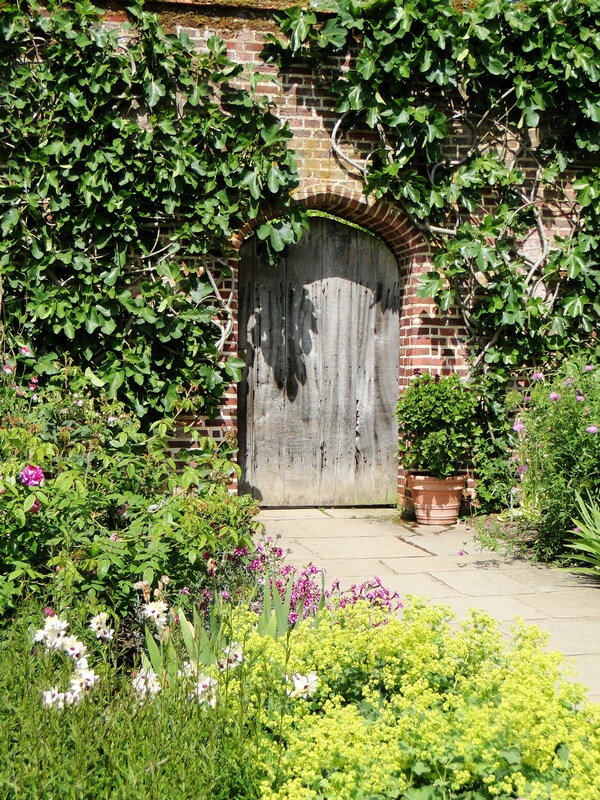 Visitors have been coming to Sissinghurst’s gardens since 1937 where they would put a shilling in a tin, often walking around the gardens as Vita and Harold gardened. Famous for its ‘rooms’ in which separate gardens were created, immaculately clipped hedges form the walls and corridors and the backdrop to the romantic planting schemes within. 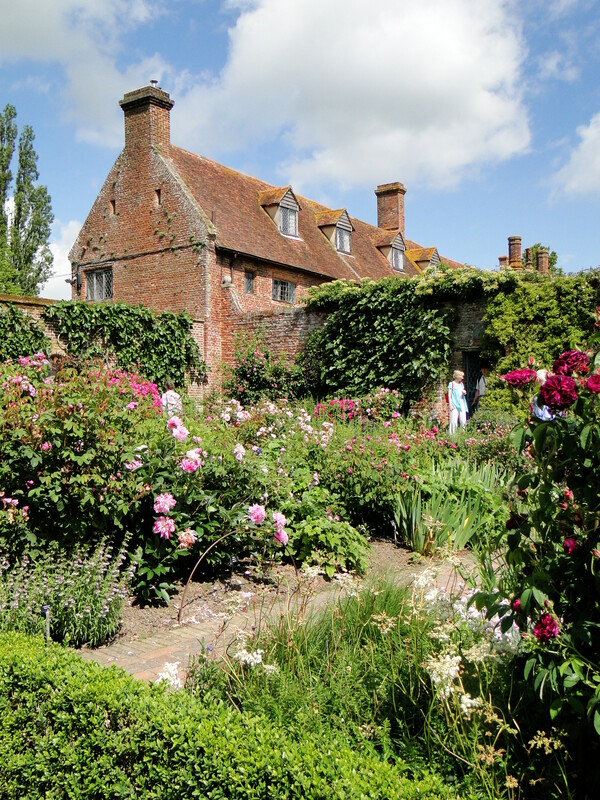 There are roses at every turn and areas with particular colour themes, such as the yellow and orange cottage garden and the most famous area of Sissinghurst, the white garden. The lawns are pristinely striped and vistas have been created to catch the eye, finishing with focal point sculptures and statues that they both collected on their foreign travels. I loved this old gate and the plants around it. Paths wend through the garden taking you to different areas such as the shady nuttery and the only herb garden I’ve visited where you can smell the aroma of the herbs without having to touch the plants. There was a meadow area along the lines of Great Dixter but it has yet to achieve the same diversity of species, and thus, the same visual impact. It was still teeming with insects and was probably where the little creatures that took a fancy to my calves were lying in wait. Only now, a week, several antihistamines and steroid cream applications later is my leg returning to normal. I’d be no good on safari in Kenya! It’s possible to walk alongside the moat, the only remaining part of the original Saxon manor house, the first recorded building on this site and look across the orchard to the medieval tower that forms such an integral part to the garden. Just like at Great Dixter the buildings provide the gardens with a stunning backdrop and add another dimension to the garden by allowing visitors to view the garden from above, if they are prepared to climb the 78 steps of the tower. 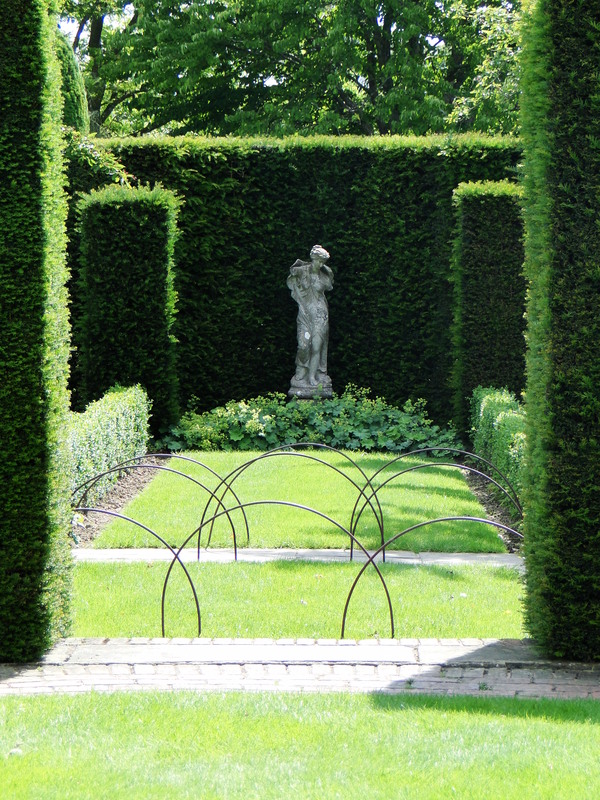 I loved this aspect, a view rarely available to the garden visitor, which meant you could see the ‘linear severity’ of the hedging and paths that Vita had talked about. Outside the garden, in fields behind the oast houses and barns, is the vegetable garden created in 2008 and awarded Soil Association organic status in 2011. Here a mixture of fruit, vegetables and cut flowers are produced to supply the on-site cafe. 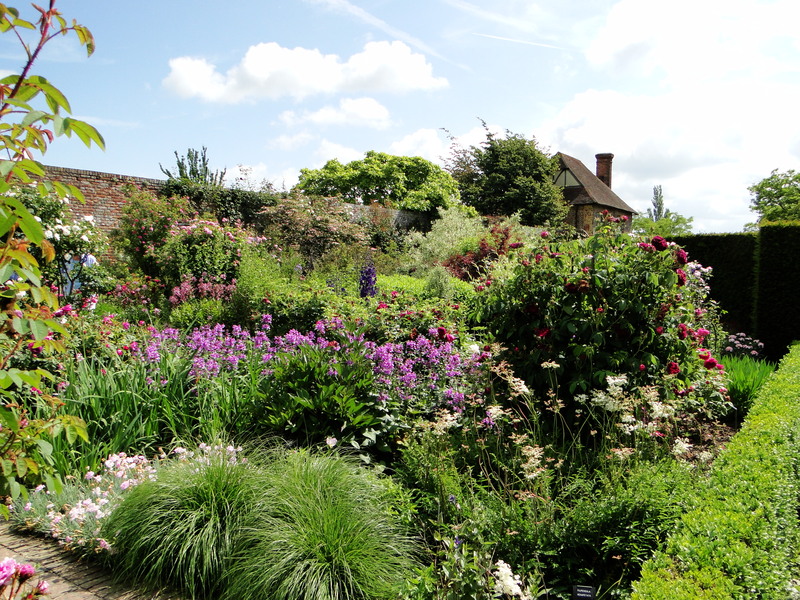 However, unlike Great Dixter and Pashley Manor there is a ‘but’ with Sissinghurst. I can’t quite put my finger on it but for a garden described as one of the best in the world I was a little underwhelmed. Horticulturally, it was frustrating to see so much bare earth in such a garden in the height of the growing season. Most evident in the much-lauded white garden which affected the potential impact the garden could have had. I loved the concept and there were areas that worked so well it was just disppointing other parts were so bare. Maybe we wouldn’t have noticed so much but after the exuberance of Great Dixter it was quite striking. There may have been reasons for this but there was nothing explaining the thinking behind this, if there was any. The National Trust in their role as manager of Sissinghurst have a difficult job to do, protecting the gardens for future generations. Do they try to keep the gardens in the form that Vita created them or do they allow the gardens to evolve? I don’t have too much problem with ‘historical gardens’ as such, as long as the visitors know what they’re getting. You would expect to visit a museum and see objects with information putting them into context and, in the same vein, I feel an historical garden needs the same information. Of course, the dilemma then is how to convey this knowledge in an unobtrusive way. 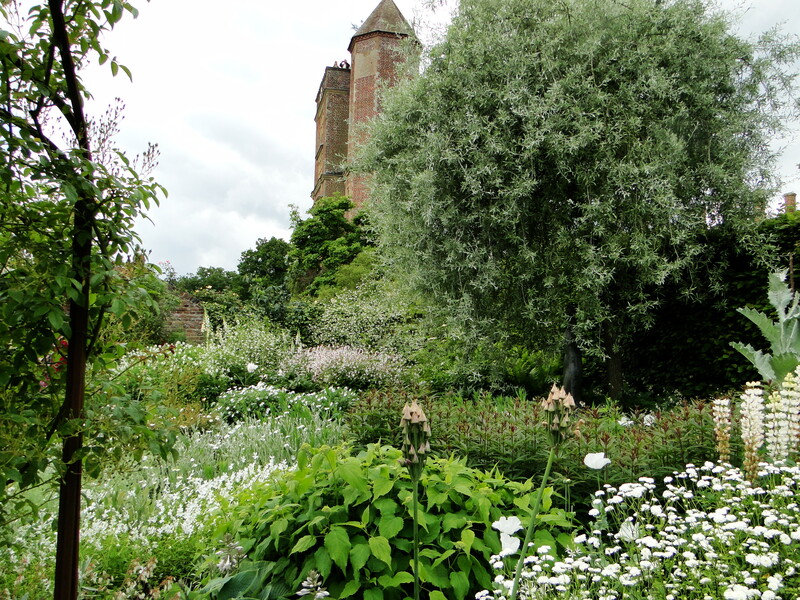 I feel though, that at present Sissinghurst is in a bit of a limbo, not sure how the gardens should be treated. There are also elements of the National Trust experience that I find increasingly annoying. I love the National Trust; they have saved and protected so many beautiful places for the nation but for those of us that are not members the push to get you to sign up for a year is becoming a bit irritating. And don’t get me started on the food. Yes, I know food again but it was overpriced for what was offered and lacking imagination, which was disappointing for somewhere that had made so much of the organic produce that was being used from the kitchen garden. Haven’t we moved on from a few bits of lettuce, tomatoes and cucumber counting as a salad? Inevitably, the crowds of people have an impact on the enjoyment of such a place. Of course, we were a part of those crowds too but it can feel a little like you’re on some sort of garden tread mill as you shuffle around paths attempting to take photographs and not getting in the way of staff mowing and gardening. The ultimate garden experience for me is somewhere that makes me feel relaxed. Sissinghurst, beautiful and incredibly designed as it is, ended up feeling too much like one of those places on the sightseeing list you cross off. A bit like if you Venice or somewhere similar; you’ll do the touristy bits but then it’s quite a relief to be able to wander off down the little side streets. I’m not sure how this can be addressed at such popular gardens, timed tickets possibly? Having looked back over the photos I can see why Sissinghurst has such a reputation but it’s a shame other elements of the visit actually spoilt the experience on the day. I’d still recommend a visit, just be prepared for lots of people, even during the week, and take a picnic. 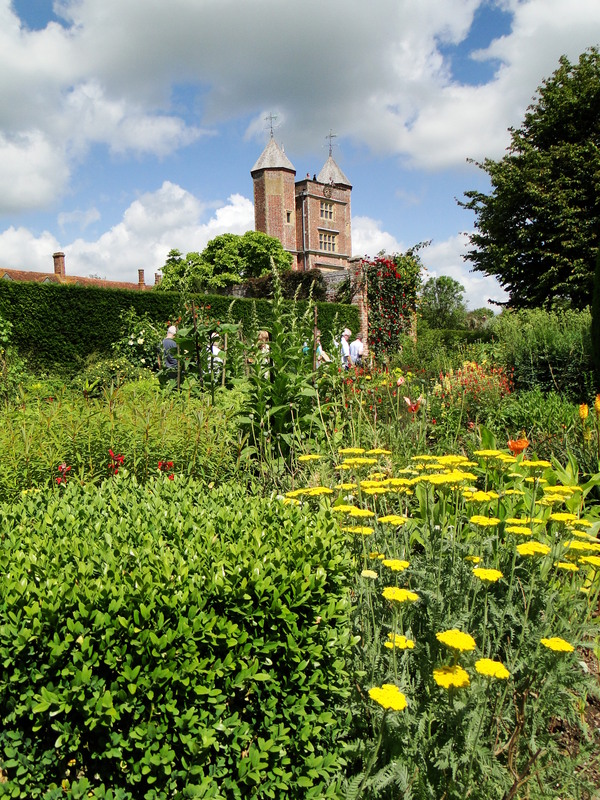 For more information on Sissinghurst visit the National Trust’s website. Woodlands play such an important part in the history, landscape and psyche of Britain. The British government discovered this last year when it proposed to sell off forestry land to raise money in these cash strapped times. It quickly backed down when a significant number of people campaigned to save our trees. It seemed that the proposed sell off triggered a realisation that our woodlands are integral to our heritage. 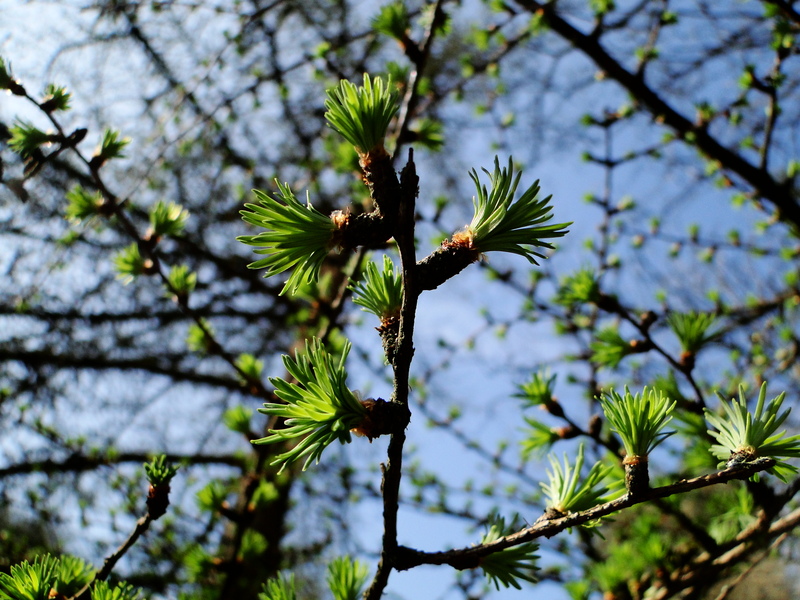 Spring is one of the best times to appreciate our native, deciduous woodland. 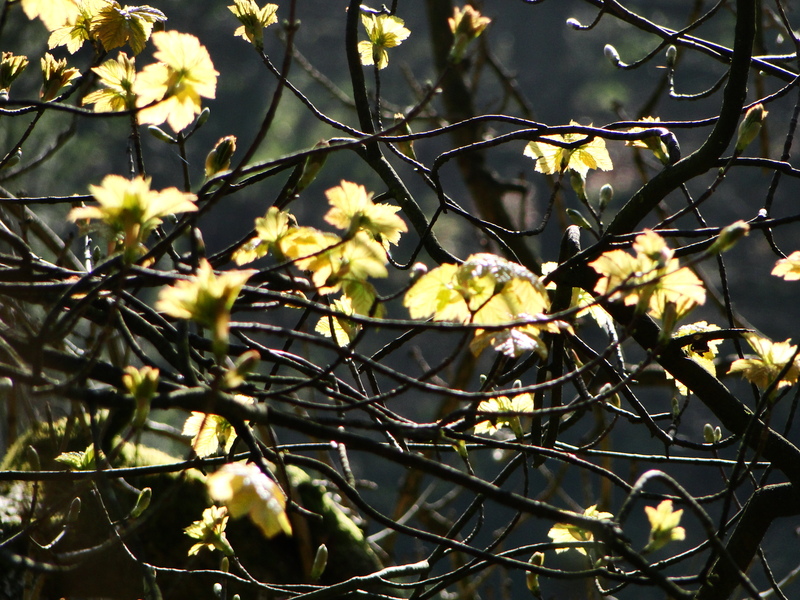 Woodland flowers make the most of the spring light that enters through the trees before leaves unfurl and the tree canopy excludes most sunlight. I’m lucky enough to live near some beautiful ancient woodland which looks at its best over the next month or so. One of my favourite walks is in the Wye Valley running along Offa’s Dyke, the old boundary between England and Wales. There is a stretch of woodland here that is very old and forms one of the most important areas for woodland conservation in Britain. English Nature credits it the same importance as the Caledonian pinewoods and the oceanic oakwoods of western Britain. Two weekends ago we made a trip there to see the carpets of wood anemones. These are the first of the woodland flowers to cover the woodland floor, followed by wild garlic which fills the air with a pungent garlicky smell and the stunning sight of masses of bluebells. 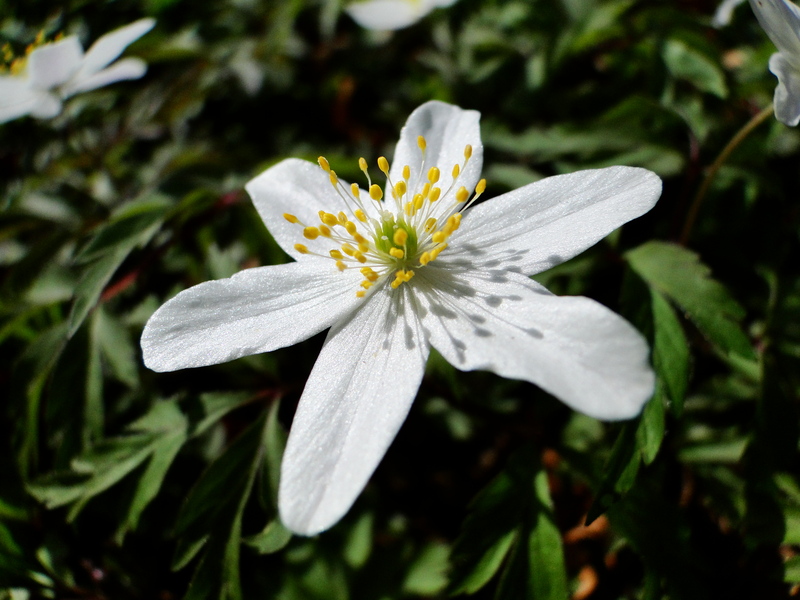 We were delighted to see the white starry flowers of the wood anemones which light up the woodland but completely surprised to see the first bluebells open since it was only the middle of March. The unseasonably mild spring had obviously encouraged them from their dormancy earlier than usual. I always think of bluebells as a May flower but maybe with our changing climate they’ll become associated more with April. Not content with one spring woodland walk, whilst visiting family, we made a trip to Hardcastle Crags about a mile outside the Pennine town of Hebden Bridge, in West Yorkshire. The woodland, owned by the National Trust, is one of my favourite places in the UK. 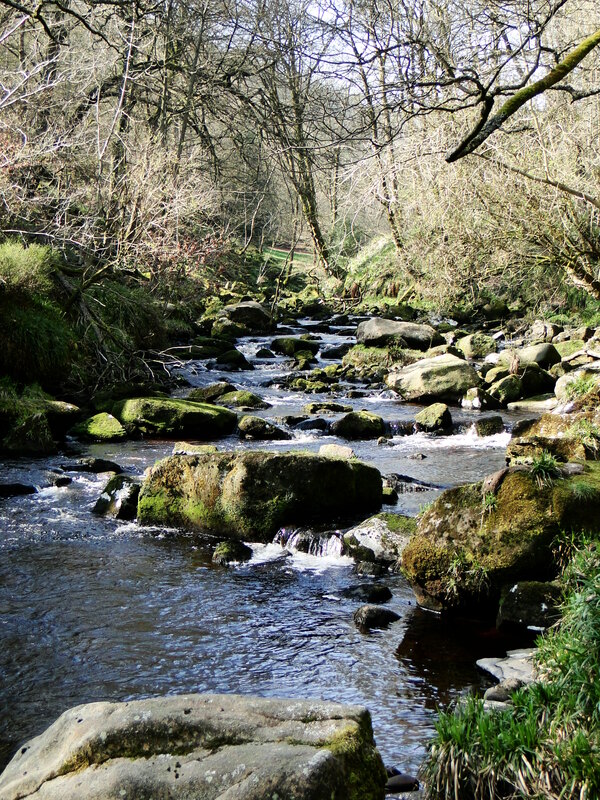 A classic woodland walk from the car-park follows the river Hebden Water up through the craggy, densely wooded valley to Gibson Mill, now a visitor centre but once a cotton mill built in 1800. Paths continue up the valley past waterfalls and finally you emerge on top of the Pennine moorland. The ‘crags’ refer to the stacks of millstone grit which you can see half way up the steeply side gorge. Hardcastle Crags is a great place to spot wildlife with us seeing nuthatches, treecreepers, dippers, grey wagtails and mating toads. It’s also home to the northern hairy wood ant. We did see huge numbers of large ants, I can’t say I noticed them being particularly hairy, but apparently it’s their eyebrows that are hairy, one for the magnifying glass I think. They live in huge anthills which can reach 6ft high and are made from pine needles which you can see dotted through the woodland. I love this place so much because it has such a magical feel. Moss covered rocks and branches, ferns, shafts of sunlight streaming down through the newly emerging leaf canopy and glistening on the water. The only sound being the flowing water and birdsong. Wood anemones were in flower here, too and there were the very first bluebells starting to open, a little later than at home but still early for the time of year. It’s fascinating to think such a peaceful beautiful place was the setting for one of the first cotton mills of the Industrial Revolution, with water from the river providing power for the mill. The mill used to employ 20 or so people in the 19th century, who lived in purpose built cottages next to the mill. In recent years it has become a pioneer for sustainability, as the National Trust has restored the mill complex so that it is self sufficient in power, water and waste treatment and is now the perfect place to stop for a cup of tea and a slice of tasty cake after all that walking and fresh air. For more information about Hardcastle Crags visit the National Trust. The Woodland Trust has some excellent tree facts and details of woodland around the country that you can visit. So if you’re thinking of something to do this Easter and we’re not all knee deep in snow and shivering then why not give your local woodland a visit. Produce from my plot - just to show I didn't just grow flowers! Following on from my last post about how difficult it is to get an allotment I thought I would write about the organisations and individuals that are trying to do something to provide land to those who want it. Whilst local councils and central government might not see the need for a new approach to allotment there are fortunately others who do. Hugh Fearnley-Whittingstall, TV cook, author and promoter of all things foodie saw that something needed to be done to match the growing demand for land on which to grow. In 2009 he launched ‘Landshare‘ a website which puts people who want to grow their own produce but don’t have the land in touch with people who might have some spare land, or a garden that is too big for them. So far the venture has proved incredibly successful with over 66,000 members. 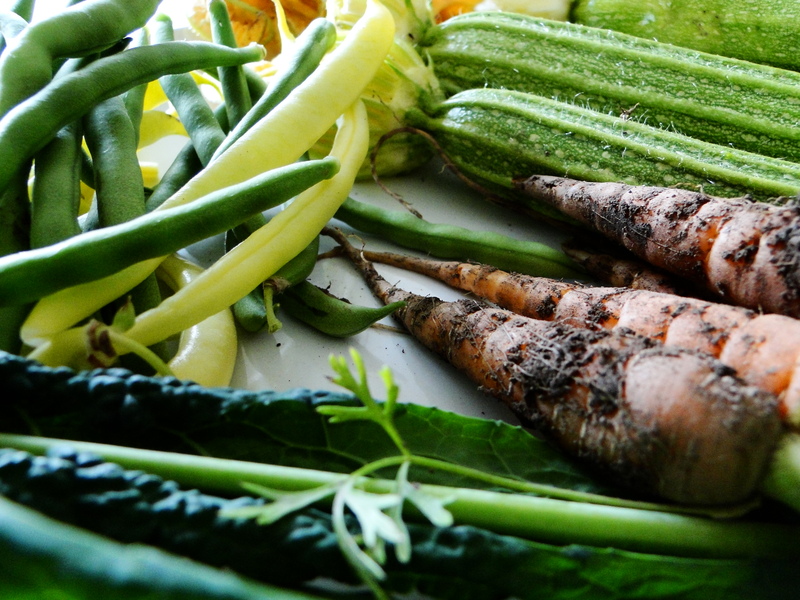 Older people with large gardens that are too big for them to manage any more now have people growing fruit and veg and sharing with them the produce. There are some people who are just too busy to garden who have released part of their garden or some who have fields that are doing nothing and have given these up to allotments. The National Trust has also joined the fight for more land. In 2009 it announced it wanted to create 1000 new allotments by 2012. They reached this target this summer. Some allotments are in walled gardens, others on vacant land near the Trust’s properties. In Woolacombe, Devon a field owned by the Trust was turned into 50 plots including one for the local Woolacombe Primary School. At Springhill in Northern Ireland a run down walled garden was brought back to life and now there are 27 allotments. Monk Coniston allotments must surely be a candidate for best location and view. Perched above Coniston Water in the Lake District the walled garden was disused until the National Trust received a Lottery grant and there are now 10 plots for the local community to grow fruit and vegetables. The Trust joined forces with Landshare and available plots at Trust sites can be found on the Landshare website and just because they have reached their target of 1000 allotments they don’t plan to stop there with another 200 planned in the future. It shouldn’t be too much of a surprise that someone saw an opportunity to take advantage of the huge demand for allotments and set up a privately rented allotment company. The New Allotment Company opened its first site in 2010 in Kent. The charge is £150 for a year or you can pay in monthly instalments. This includes water, storage and manure. It sounds expensive and may well price some people out of the opportunity to grow their own. The other downside is that you sign up for 3 years with the opportunity to leave after the first year but after putting in all the hard work of establishing your plot it would be difficult if after the 3 years the rent rose and became prohibitively expensive. However, the plots are pre-prepared so no dreadful weeds to remove and the site provides secure storage, toilets and an all weather shelter and I know from my own experience that those would be welcome additions to my own allotment site. It is good to know that people have taken on the task of dealing with the lack of land for growing but this should not be an excuse for local authorities to neglect their responsibilities. Politicians like to suggest they are in touch with the voter and listen to what they want but they seem to have some wax in their ears on this one. It would be nice to see a local councillor somewhere in the country to take up the issue of allotments and the lack of them.